This epic horror fantasy film written and directed by the hugely talented artist/author/director Clive Barker was first released in cinemas way back in 1990. At the time that version of the film had been sadly recut and edited under orders by the film studio and producers, to sell it as more of a ‘slasher’ style movie. The real film was never intended to be like that, and at that time so much of the film was abandoned and lost for many years, with most people believing that the original version would never really ever be seen by the public. After close to twenty five years, and with a sudden amount of sheer luck and then extreme hard work and effort, reels of footage were found and eventually cleaned up over the last couple of years. After a rough cut which was then toured around the UK, USA and other international film festivals, a strong response prompted the eventual successful completion of the closest cut of the film which Clive agrees with. I personally live in the UK, and so had to get a US dvd copy (no idea when or if it will come out over here yet) and hope for the best. Thankfully I have been able to watch it today. Nightbreed was adapted by director Clive Barker, who had only just has huge international success with his first horror film Hellraiser, also based on another of this short novels. This film though, while containing monsters and including some bloody and graphic sights, was much more than a simple slasher or gore fest horror flick. I first saw the cinema cut version recorded from cable tv in the late 90’s, and was already a huge Clive Barker and Hellraiser fan then. As many have stated, that original cinema version of Nightbreed left out so much, and distorted the story vastly. I did though easily love that version because I could see enough original and stunning imagery and characters and pieces of the story between the patchwork structure of atempted slasher flick. I had read the novel Cabal which it was based on, and while I could tell that it was the same story, I knew that there were parts left out, or cut short which was strange enough as it was a fairly short book. Over the years, reading interviews from Clive Barker I found him and some of the actors and other involved discussing the tragic events which had produced the box-office and artistic failure. Clive knew that the film studio probably did have reels of missing film scenes and footage for years, but would not let him have it. Thankfully, a glorious load of extra footage was hit upon suddenly a couple of years ago-and here we are with the cleaned up and recut version of Nightbreed today. I did see the rough ‘Cabal Cut’ of Nightbreed when it was shown in some select UK cinemas a year or more ago, and though most of the found scenes and new footage was of fairly terrible visual quality (the film reels having deteriorated over years slightly) it was so great to see more of Midian and more of the monster I had seen pictures of but never seen on screen included in the film. I sat down this afternoon and enjoyed a restored and spectacular horror fantasy movie, this time a slightly different, coherent and emotional film. Most of the structure of the film is still the same, but there a number of extended scenes and sequences which previously were only a second or two onscreen. This time Midian is a much more wider, elaborate, detailed place, there are dozens more monsters within the caverns below. The relationship between Boon and Lori is deeper, more touching and real. We care for them more, and by the end of the film, it means much more to see them get through the entire dramatic tale. It does feel less like a simple Friday the 13th rip-off, with Dekker moving back in the narrative in the second hour, and more of the monsters and world of Midian move forward this time. I would agree that yes, there could still be say around ten minutes cut down perhaps, but largely this is a very satisfying, hugely enjoyable dark fantasy movie, now thankfully given the true finish and version that it should have had so many years ago. From what I see in the magazines, the papers and online, there really is no shortage of spectacular big movies of science fiction and fantasy due in 2015 and it seems to start right away. What films are you looking forward to in 2015? This month we get Ex-Machina, a thought provoking and very intelligent science fiction thriller from Alex Garland-writer of The Beach, 28 Days Later and Sunshine to name only some of his work. This is his first film as director and he keep it like that from this point on. I have read in the last week or two, several pieces about him and the film and it could be one of the more challenging and serious SF movies that we will see this year. In some ways similar to the Johnny Depp starring film Transcendence from last year, this movie investigates artificial intelligence and significant advances in technology which could change our lives and work and future drastically. While the Depp movie recieved mixed reviews and was largely pessimistic about A.I. and what could happen after we reach the expected ‘singularity’ point in advances, Ex-Machina seems to look at things with possibly a more optimistic view, or at least this is how director Alex Garland sees our potential with technology. This in science fiction, could actually be fairly radical. There have been a number of sci-fi moves which suggest that we should tread extremely carefully with research and us of new advances and how we could then come to rely upon them up to a dangerous degree. Here with Ex-Machina, there seems to be a more rational or objective take on technology, and how we may live with machines which could look like us, live like us and help us on a daily basis. From Asimov’s ‘three laws of robotics’, to 2001’s HAL and then Speilberg’s A.I. film and then the UK film The Machine from last year, there have been many depictions of robots and cyborgs on screen, but possibly they are getting to a place where we are giving them more respect and space in new and modern stories and films. As our technology is now so close to robots and machines with A.I. almost passing the legendary Turing test, is it right that we seriously accept and embrace man-made machines which we could live and work alongside every day without forgetting that machines breakdown, fail, cause serious disasters and malfunction regularly and put many people out of work permanently? There are so many questions to ask, but with films like Ex-Machina we are probably move along in the right way. 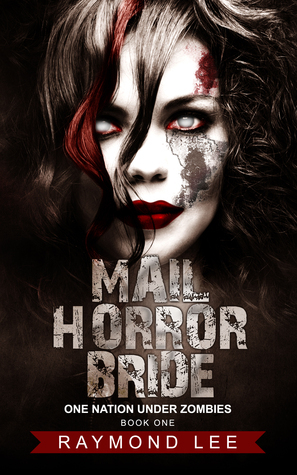 What is the plot of your book: Mail Horror Bride? How do you destroy your enemy? Go for the heart, then take over the brain. The Z1219 virus, created by Russia’s most skilled scientists, is the deadliest biological weapon in history. Harbored in the human bloodstream, it remains undetected until detonated. Once detonated, the host becomes a walking corpse with only one goal: Eat everyone. And now it is in America, packaged in the mail order brides the Russians shipped over to destroy us all. With the disease now running rampant and no cure yet discovered, it is every uninfected person for himself. Homes are destroyed and the families inside them torn apart. Relationships can help or hurt as those left uninfected discover they are not entirely untouched by the disease. Into a new year…new tales in space and terror and more….. This is now 2015. Welcome, and if you were not looking forward to it, or did not wish 2014 to end…well, that is no longer an option. Here we are, and we should look ahead with confidence, commitment, and go forward toward challenges and adventures like we never have in the past. Currently I am finishing the new manuscript for my next science fiction novel. It is fairly different to Orbital Kin, with much more story taking place in the greater future and in space. With luck and time, it will hopefully be published months down the line. I am then returning to my first horror novel, redrafting and focusing the plot. It is set in the north of the UK, and is a supernatural dark tale. After that I may go back to the literary novel that I have just about written in first draft.